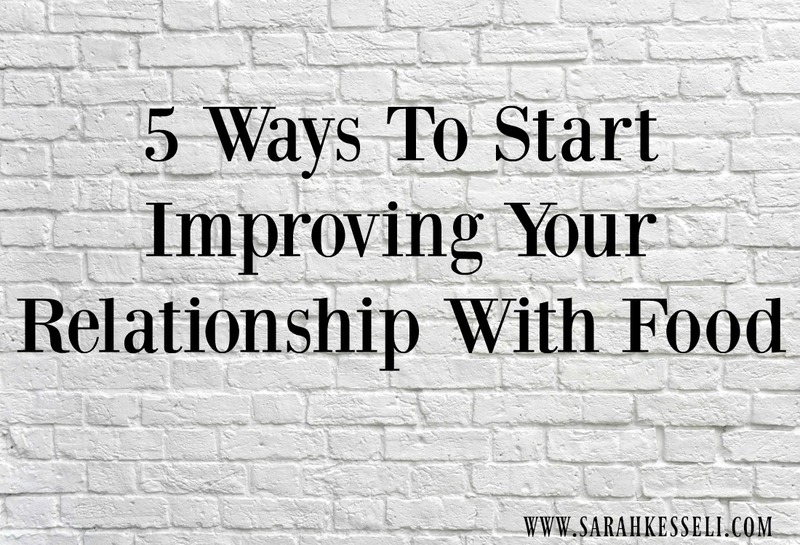 5 Ways To Start Improving Your Relationship With Food - Welcome to SarahKesseli.com! It’s crazy to think how our relationship with food changes from the time we are born until the time we reach adulthood. When we are born, we eat when hungry and stop when we are full. As we get older, our relationship with food changes. We are influenced by magazines telling us what we should look like or what to eat so that we can appear like the women (or men) on magazine covers. We begin to scrutinize our bodies and our plates. It seems like everybody else knows what’s best for our bodies except us. When the latest magazine diet doesn’t work for us, we become frustrated, confused and begin to talk negatively to ourselves. We use food and exercise as punishment. In the best case scenario, this leads to a day to day struggle that we eventually give up because we know it’s not sustainable. For others, it is more severe and can lead to eating disorders and other health complications. Beginning your journey towards a better relationship with food can seem very scary and overwhelming. But, it doesn’t have to be! Today, I am sharing with you five of the steps I recommend to my clients to begin their journey to a healthy and sustainable relationship with food. Nobody wants to follow rules anyway! In fact, the rebellious side of us wants to BREAK the rules through overeating and binge eating, which in turn leads to more restriction and ‘rules’. So throw away those external rules about meal timing, points, macros, and calories and let your internal cues rule. I have yet to meet a single person who eats perfectly, myself included! There is no such thing as perfect. Start letting go of this mindset through the use of affirmations. Each day remind yourself that you are uniquely and beautifully made just as you should be. You are good enough. Do not eat foods that aren’t appealing to your sense of taste and smell. Eating this way will never result in real food satisfaction. Instead, choose foods you enjoy! When you sit down to the table, you want all of your senses to come alive so that you walk away feeling satisfied in the body, mind, and soul. Accept Yourself And Your Body. If you are always focusing on how much more weight you want to lose instead of loving what we are at the moment, you will have a hard time improving your relationship with food. Negative self-talk is no recipe for success in this area! Instead, begin to talk kindly to yourself, about yourself. You may notice when you are nicer to your body, you tend to eat better without even trying. Reconnecting with your internal signals of hunger, fullness, and satiety is the key to improving your relationship with food. Once you have mastered this either on your own or through coaching, you will find a sense of life in yourself that you never knew existed! Above all, Trust yourself! You are much smarter than you realize when it comes to understanding your body’s needs! Have you ever struggled with any of these? How have you worked on improving your relationship with food? Do you have any other ways in which you work on improving your food relationship? Learning To Savor Every Bite. The Importance Of Eating Slow.